So yeah... what was that all about, then? 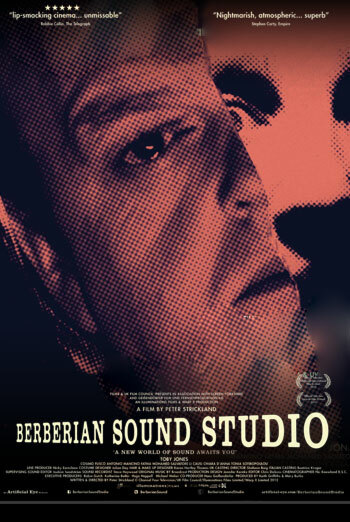 Seriously, I'm not even going to pretend that I understand what BERBERIAN SOUND STUDIO was trying to convey, and yet I found every frame from first to last compelling as Hell. The closest thing I can think of to compare it to is the Coen Brothers' BARTON FINK, in that both films deal with the way that the less savory aspects of the film business can corrupt an artist. In BARTON, the artist/protagonist was a screenwriter; here, it's a sound effects technician. Gilderoy (Toby Jones) is best known for his work on children's TV shows, but for some inexplicable reason Italian director Santini (Antonio Mancino) thinks he's the right guy to provide the sound of a hot poker being inserted into the nether regions of a witch in his latest shocker THE EQUESTRIAN VORTEX. Certainly Santini's producer Francesco (Cosimo Fusco) doesn't see why Gilderoy is so special, seldom treating the sound wizard with more than contempt. Outside of a beautiful animated title sequence, we see nothing of the film Gilderoy is working on. What we do see are the mechanics of how a European film of the seventies was to a large degree put together in post production. Such films, especially in Italy, were shot without live sound so that everything from the dialogue to the sound effects to the music had to be done after the fact. That may seem like a lot of extra work, but given the nature of the movie business at the time, when foreign films were dubbed for sale to other countries and the international casts often spoke their lines in different tongues, it made a kind of sense. Like Barton Fink, Gilderoy is a sad-sack fish out of water, only with the added difficulty of a language barrier. He does his best to be professional, but the failure of the production company to reimburse him for his airplane ticket combined with the distasteful nature of the film he's working on combine to create considerable stress and tension between him and the Italian crew. There's also a fair amount of tension between Santini and his leading lady Elena (Tonia Sotiropoulou). The film is meticulously conceived and executed, imparting a sense of the kind of films that inspired the one its characters are making – specifically, a kind of blend of Mario Bava's BLACK SUNDAY, Dario Argento's SUSPIRIA, and Michael Armstrong's MARK OF THE DEVIL – all without actually showing us the actual film itself. Although there are numerous nods to the films that inspired it – black gloved projectionists in lieu of black gloved killers, bold primary colors, and a throbbing synth rock soundtrack – BERBERIAN SOUND STUDIO is not interested in simply being a retro homage ala BLACK DYNAMITE or MACHETE. For all its fondness for films of the past, this is a film for today. None of which makes it any easier to grasp what the point is. And yet, as was the case with the similarly frustrating but compelling BEYOND THE BLACK RAINBOW, this film really got to me on a subconscious level. Hard to recommend, but for the select few who enjoy challenging films that don't give up all their answers on a single viewing, and for those who just love anything to do with classic Euro horror, this is definitely worth a look. 2 1/2 out of 4 stars.